I spent years of my life studying for a PhD, which is now pretty useless since I turned to comedy! 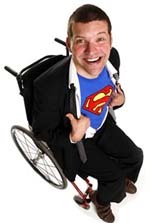 I was born with cerebral palsy - my outlook on life as a disabled person shapes my comedy. My first one-man show, 'The All-Star Charity Show', won critical acclaim at Edinburgh Fringe in 2003. The show was named Critics' Choice in The Times and I was described as a "powerful comedy voice" and "stunningly hard-hitting" by critic Kate Copstick in The Scotman's round-up of the best shows that year. My next show, 'The Jim Davidson Guide to Equality', was similarly well-received and has toured over 40 theatres and art centres during 2005. Responding to Jim Davidson cancelling a show when wheelchair users were in his audience, I vowed to cancel if Jim turned up to his show! The show goes on to compare Davidson's ideas about equality to those of Tony Blair. Ironically, a predictably crap joke by Cherie Blair about me being a 'sit down' comic at a Labour Party Conference got me splashed across every tabloid in the country. Sometimes what counts is not the joke itself but the person telling it! I have also acted with Graeae Theatre Company and write for the BBC website Ouch. In 2005, I was named 'Pick of the Fest' by Radio Merseyside and won the Dada Award for Best Performer. On BBC Radio 4, I acted as script advisor and contributor for a two-part documentary on comedy and disability called 'Should We Be Laughing?' I also appeared on a number of other magazine programmes such as The Message, Feedback and Word of Mouth. In 2004, I was profiled by BBC Northwest Tonight. Later that year I was a guest reporter on BBC 2's Newsnight, writing and presenting a film about disability and the Abortion Act. I recently completed the BBC / Channel 4 Talent Fund Course for Disabled Actors.